Meet Jack Yeager. Jack has been visiting the Bay Area Contractors for 50 years recycling metals. 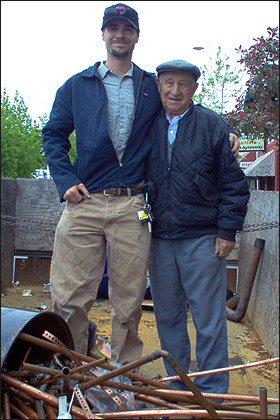 Jack, a Holocaust Survivor, lived in the woods of Poland during World War II. During that time, Jack learned not to waste anything. Today at over 80 years old, he still visits our families shop and continues his recycling tradition. I’m happy to say, it is a way of life that he has passed on. We recycle paper, cardboard, metals, batteries, print cartridges, mercury thermostats, refrigerate gases and more weekly. Our company reduced half of its vehicle standard size to mini vans starting in 1995. We are using mapping programs and GPS to reduce traveling. We installed a hi-efficient lighting system for our warehouse, and of course, we have Energy Star thermostats, heating systems and air conditioners. We installed Toto Eco Drake toilets to save water. We are considering Solar to supplement our electric needs. Air conditioning refrigerants were discovered as one component damaging our atmosphere. Today refrigerants R-410a, and Puron are ideal replacements for R-22. Our air conditioning technicians are EPA certified to work with these refrigerants. All R-22 is reclaimed and sent back to DuPont for recycling. Saving water is also saving energy. Water is stored in reservoirs both above and below ground. There is a system of canals and piping that use gravity for flow. Most water is pump several times at different points. Saving water saves the energy used for pumping. Harry Clark Plumbing and Heating Inc. is part of a team with Alderson Construction, building the Lennox Residence in Lafayette. This home designed by Faulkner Architects, known for sustainable building practices will be completed in the fall of 2009. It incorporates gray water waste system, rain water collection system, triple glazed low E windows, R410A refrigerants, variable frequency drive fan motors and water saving fixtures. This home design will be the basis for future Lafayette Green Builders. Harry Clark plumbing and Heating is proud to be part of this project. Many of the quality products Harry Clark sells are certified for Green Building. As new product and services become available we will continue to expand our offerings. Since our beginning, Harry Clark Plumbing and Heating Inc., has recommended and sold hi-efficiency furnaces, air conditioners, water heaters and water saving fixtures. The Energy Star Logo has been proudly featured on our website since its beginning. Today furnace sales are mostly Hi-Efficiency units with AFUE 95%.or higher. High efficient furnaces produce less greenhouse gases, save energy for my future generation, reduces energy costs and helps stimulate the economy. Furnaces with ECM motors use 80% less electricity, create more even heat, are quieter, and better for air filtration.